From time to time you may have the need to swap a Location from one Patrol Group to the next when organizing your Patrolguide Schedule. Location A happily belongs to Patrol Group A. When users log into Patrolguide, they select Patrol Group A and start touring Location A (among others). But then, your market expands. Happy day! You add some additional contracts and Locations, and you realize that Location A should really belong to Patrol Group B. When users select Patrol Group B, they're not seeing Location A like you want them to. What went wrong? When a Patrol Work Order is created or updated, it generates out several weeks of repeated Tour Sets according to the days of the weeks, quantity of tours, and operating times that you define. For finite Contract periods, with a defined End Date/Time, Tour Sets are generated for the entire Contract. This is for performance and forecasting reasons. When those Tour Sets (also synonymously described by us as Tour Schedules) are changed, they need to be regenerated. The reason why Location A isn't appearing in Patrolguide under Patrol Group B, despite you already putting it there, is that the Tour Sets that are available to Patrolguide have been cached with the old Patrol Group A information. 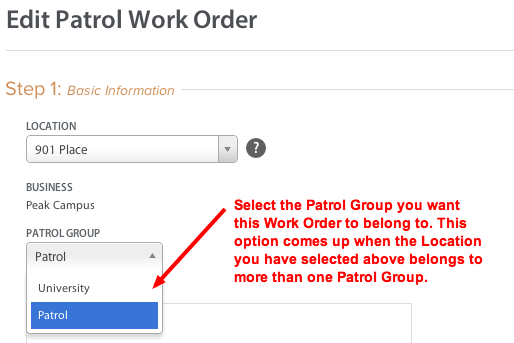 Simply go into each Patrol Work Order for that Location A and verify that the new Patrol Group is displayed. If you haven't removed Location A from Patrol Group A, then you'll have the option of choosing either Patrol Group A OR Patrol Group B. Ensure that Patrol Group B is selected and hit the SAVE button! Note: Because Tour Sets are cached for up to weeks at a time, they require some time to be regenerated. After saving the Patrol Work Order with the new settings, please allow several minutes for the worker process to generate out all the changes before double checking them on the Patrolguide Schedule. If the changes are being applied to Tour Sets that are already being worked, then the changes may not manifest on the Patrolguide Schedule or in Patrolguide until the next day!